I love Melania. I have no shame in this, because she’s such a fantastic lady to look up to. Melania has been running a more public and more active schedule than J. Crew Michelle ever did, but does it with a much smaller ring of staff. New reports on the number of staff required for the First Family are confirming that Melania has significantly reduced the number of her personal aides on the FLOTUS’ office payroll, which means in all that the public pays less and gets more in the way of appearances and activity. During the first year of Barack Obama’s presidency, Michelle had 16 people working for her, with their payroll totaling $1.24 million. For Melania’s first year, she had only 4 people working for her office by June, with a salary total of $486,700. The difference between the two payrolls is approximately $750,000. The details have come out in a report by the White House which is sent to Congress listing the names, positions and individual salaries of their aids and personnel. In both the Obama and Trump administrations, staffers have been attached to the First Lady, whose public role has expanded in recent decades. 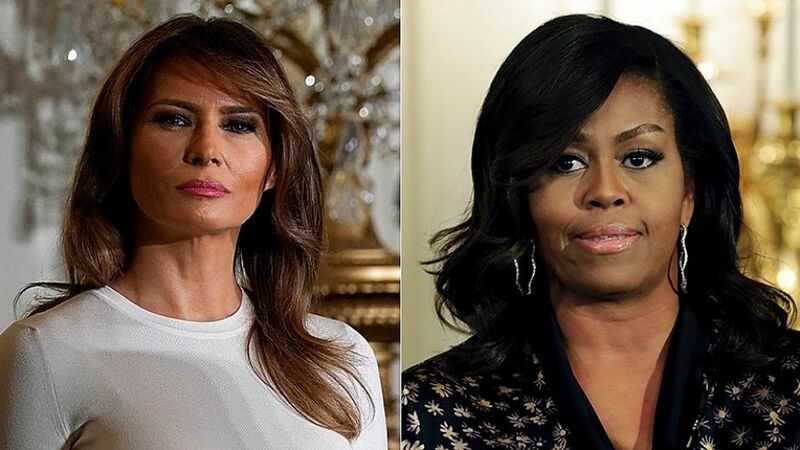 The additional people whose roles include attending to the First Lady brings the total number of first year aids to Michelle to 24 people, with 9 for Melania. Michelle’s entourage dwarfed every other First Lady, but Hillary Clinton at 19 staffers and Laura Bush with 18 staffers weren’t too far behind the curve. Even now, “First Lady Hillary Clinton” seems like a funny thing to write about. Earlier this week, we reported that Melania has been sending personal letters to the Gold Star families that were forgotten under the Obama administration, with one mother sharing the letter she received about her son who had died in Afghanistan in 2009.